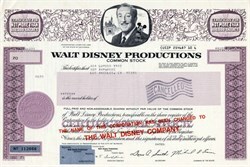 Beautiful certificate from Walt Disney Productions issued in 1986. This historic document was printed by the Jeffries Bank Note Company and has an ornate border around it with a vignette of Walt Disney & Mickey. This item has the printed signatures of the Company's Chairman, and Secretary, and is over 28 years old. This was a printers test certificate that was issued to ADA Lumber Yard on 100 Anywhere St. in Los Angeles.